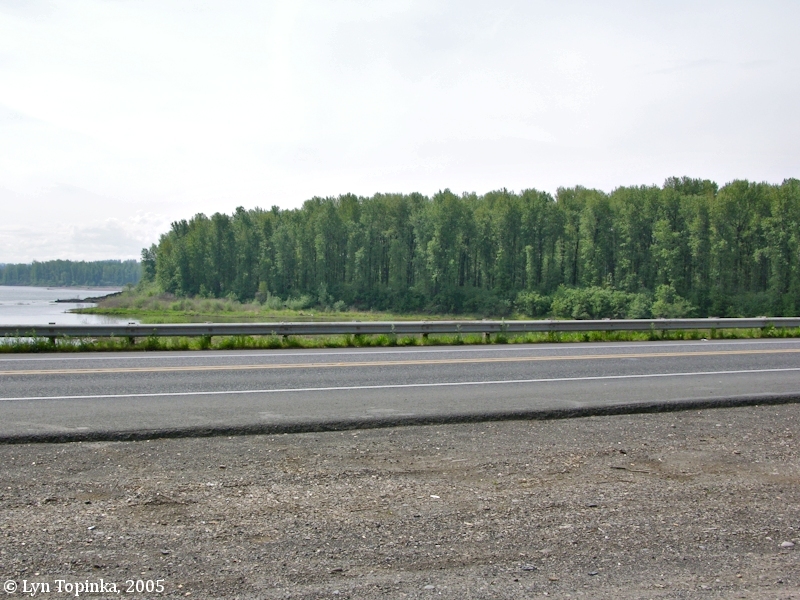 Click image to enlarge Lady Island, upstream tip, Washougal, Washington. Lady Island as seen from Washington State Highway 14. Image taken May 1, 2005. 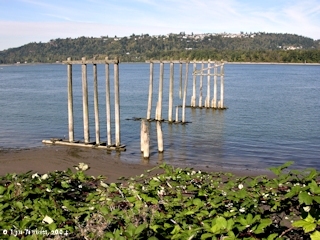 Lady Island is located near the northern shore of the Columbia River at River Mile (RM) 119, and is separated from the mainland Washington by the Camas Slough. Lady Island lies just upstream of Government Island and Vancouver, Washington, and downstream of Camas and Washougal. 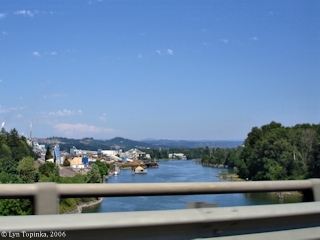 The Washougal River enters the Columbia behind the upper end of Lady Island, while across the Columbia on the Oregon shore is the mouth of the Sandy River. 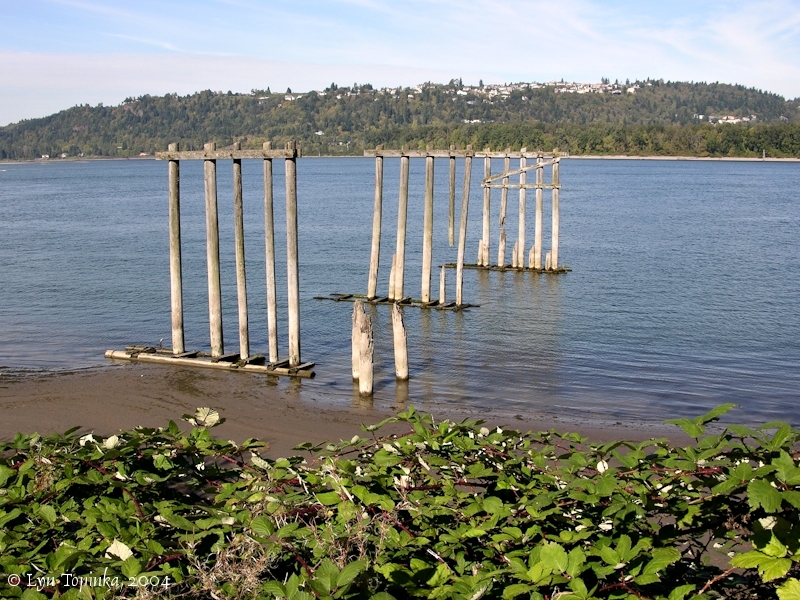 Today part of Lady Island is the location of a pulp mill, and Washington State Highway 14 crosses the island. The island is the property of Crown-Zellerback Corporation. Prune Hill, a cone of the Boring Lava Field, rises behind Lady Island. 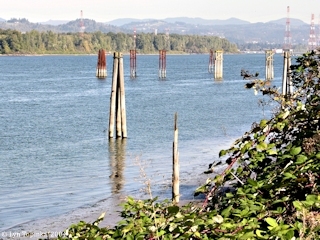 Good views of Lady Island can be seen from the Oregon side of the Columbia at Chinook Landing. Lewis and Clark passed the island in 1805. The originally called the island the "Isld. of Fowls", but on the return trip referred to the island as "White Brant Isld", or "whitebrant island", after the white lesser snow goose. Lewis and Clark's draft map called the island "Fowls I." [Moulton, vol.1, map#88] while their journey map referred to the island first as "Brant I." (which they scratched out), and then as "White Brant Isld." [map#79]. In October, 1792, Lieutenant William Broughton, of Captain George Vancouver's expedition, visited and named Lady Island "Johnstone Island", and stated it was 3 miles long with a "bold, rocky shore". In 1841, Charles Wilkes of the U.S. Exploring Expedition called the island "Frost Island" and noted it was 2 miles long. "... The course of the Columbia above Vancouver is to the southward and eastward. Its average width is three-quarters of a mile; this includes the islands which ave been formed by its deposits and serve to contract its channel. From Point McLaughlin to Frost Island, a distance of 10 miles, the river is nearly straight, and the channel is along the north shore. The hills which bordered the river prairies below, here approach the bank. Along the south shore lie Smith, Rower, Sandy, and Douglass Islands. The water is too shallow for even small vessels to use the passage between the islands and the south shore. Boats and barges may pass through. The channel passes from the north to the south shore, between Douglass and Frost Islands, and again seeks the north shore beyond Frost Island, between it and Bachelet Island, the river changing its course more to the eastward. Frost Island is 2 miles long; it lies near the north shore. Abreast of it the river is one-third of a mile wide. To the north of the east end of Frost Island is Evert's Bay, nearly circular, a mile in diameter. 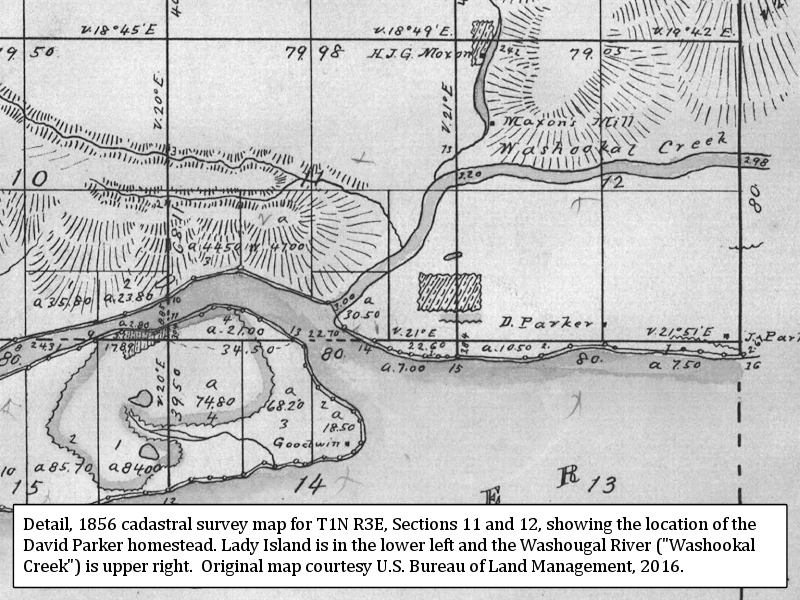 ..."
An 1857 cadastral survey (tax survey) for T1N R3E shows a "Goodwin" house on the east tip of Lady Island. The island is not named. An 1863 cadastral survey has "Goodwin" written in pencil (?) in the middle of the island. Again, the island is not named. The U.S. Bureau of Land Management, General Land Office Records, show a William Goodwin and Catherine Goodwin being issued a land title for 403.93 acres on February 25, 1864, for parts of T1N R3E of "Lady Island", under the 1850 "Oregon-Donation Act". An 1888 plat map of "Clarke County, Washington Territory" shows W. Goodwin and Eli Davis with a Donation Land Claim (DLC) ON "LADY'S ISLAND". Joseph Lady was not listed on the island. His DLC was listed further north in Fern Prairie. Sheep grazed on Lady Island in 1897. An undated plat map from presumably between 1915 and 1925 shows "Pittock & Leadbeter Co." located on the north shore of "Lady Island". The U.S. Board of Geographic Names made "Lady Island" the official name in 1914. Other spellings in use at the time were "Ladys Island" or "Lady's Island". 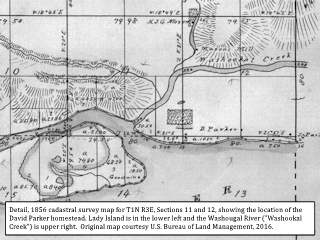 Click image to enlarge 1856 cadastral survey (tax survey) map show parts of Lady Island and Washougal. Cadastral Map for T1N R3E, 1856. Original map courtesy U.S. Bureau of Land Managament, 2016. Robert Hitchman in "Place Names of Washington" (1985, Washington State Historical Society) states Lady Island was named for Joseph Lady, who arrived from Missouri in 1853 had a land claim on the island. HOWEVER, there are two problems with Lady Island being named after Joseph Lady. First, cadastral surveys (tax surveys) and Donation Land Claims show Joseph Lady's land claim being miles north of Lady Island in Township 2 (Fern Prairie), while Lady Island is miles south in Township 1. The U.S. Bureau of Land Management's 1863 cadastral survey (tax survey) for T2N R3E shows "J. Lady" having a claim for 320.10 acres of parts of Sections 22, 23, 26, and 27, with the majority of the property being in Section 23. The General Land Office (GLO) Records, show a Joseph Heirs of Lady and Nancy Lady being issued a land title for 320.1 acres on September 27, 1865, for T2N R3E, Sections 22, 23, 26, and 27, under the 1850 "Oregon-Donation Act". Second, Lady Island was called "Lady Island" in an 1851 report, two years before the Lady family arrived in the area. Lady Island was mentioned in an 1851 report (two years before Joseph Lady arrived in the area) requesting a road be established from Vancouver to the Cascades, with a short road leading down to "Goodwin's Ferry on the head of Lady's island." "July 7, 1851. 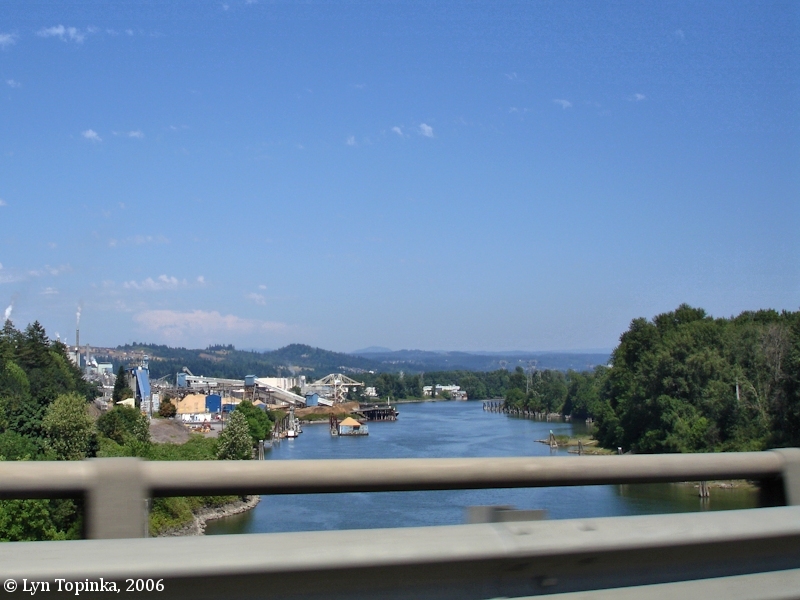 It is ordered that a road be viewed from Columbia City (the city of Vancouver was so known at that time to distinguish it from Fort Vancouver) to the Cascades, whereupon S.D. Dixon, John Brown and Milton Hamilton were appoited viewers thereof. Signed -- William Simmons, William Goodman, commissioners." "The report being received by the court, the viewers report it being most of the way impossible at present to construct a road to the Cascades; thereupon the court ordered to open and locate the said road as it was viewed from Columbia City (Vancouver) as far as Joseph Gibbons, at or near Cape Horn mountain." 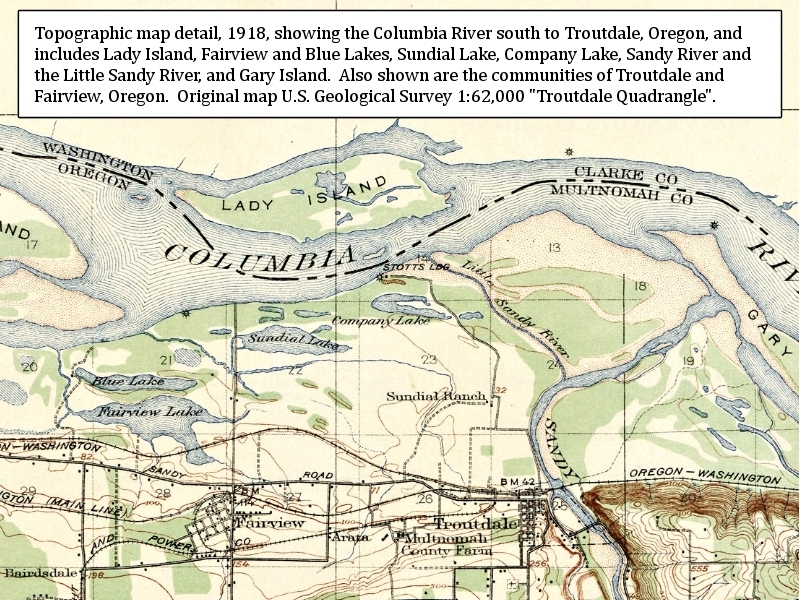 "A petition was presented by Silas D. Maxon, with 20 petitioners, praying for a road commencing at Columbia City and leading towards the Cascades, terminating at the head of the bottom land known as Ough's, and also for a road intersecting said road at some convenient point leading to the landing at Goodwin's ferry on the head of Lady's Island." Click image to enlarge Base of Prune Hill and Lady Island, from Chinook Landing, Oregon. Prune Hill is one of the cones of the Boring Lava Field. Lady Island is the low trees in the middleground. Image taken October 11, 2004. 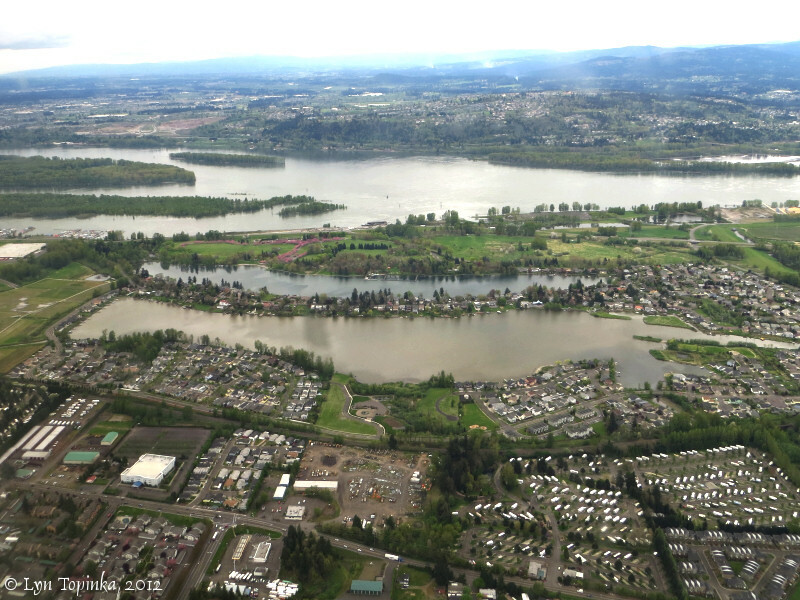 Click image to enlarge Lady Island and parts of Camas, Washington, as seen from Chinook Landing, Oregon. View from Chinook Landing Marine Park, just off of Marine Drive. Camas, Washington, is towards the right. Image taken October 11, 2004. Camas Slough separates Lady Island from Camas, Washington. Click image to enlarge Camas Slough, Washington. 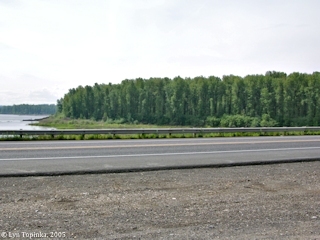 The Camas Slough separates Lady Island (right) from Camas, Washington (left). View from Washington State Highway 14. Image taken July 2, 2006. 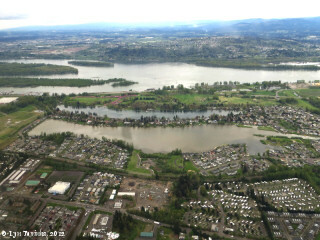 "The little town of La Camas, on the Washington side, above Vancovuer, is having its full share of high water trouble. Work has been suspended at the paper mill, the flat north of town is many feet under water, and the boundary of the flood is now on a line of McMaster's store, which the water just reaches. From the steps in front of Cowan's store, opposite the mill, crizens now put in their spare hours fishing, and make good hauls of trout and other fish. The first floor of the residence of Supt. West, of the paper mill, is under five feet of water, and the family has been obliged to seek safer and more comfortable quarters. Another loss to Mr. and Mrs. West was the destruction of their handsome garden of flowers, the pride of all La Camas. The steamer Ione now makes its landings immediately in front of the La Camas hotel. Lady's island, in front of the town, is completely submerged, and steamers cross and recross the water over the island. The buildings on the island have all been securely anchored, and residents have deserted their homes for safer quarters." Source: "The Daily Astorian", June 12, 1894, courtesy Historic Oregon Newspapers Archives, Unviversity of Oregon Libraries, 2016. Mr. and Mrs. Eli Davis Celebrate Golden Wedding Anniversary. "Mr. and Mrs. Eli Davis celebrated their fiftieth wedding anniversary recently at the home of their daughter, on the Columbia River near Camas. They were among the pioneers of Oregon and Washington, coming from Illinois in 1880. They resided a short time in Portland, and then purchased Lady's Island, in the Columbia River, residing there ten years. After disposing of their home, they purchased a dwelling in Vancouver, Wash., where they lived 15 years. For the last three years they have lived in their cottage home." Source: "Sunday Oregonian", September 20, 1908, courtesy University of Oregon Historical Newspaper archives, 2015. 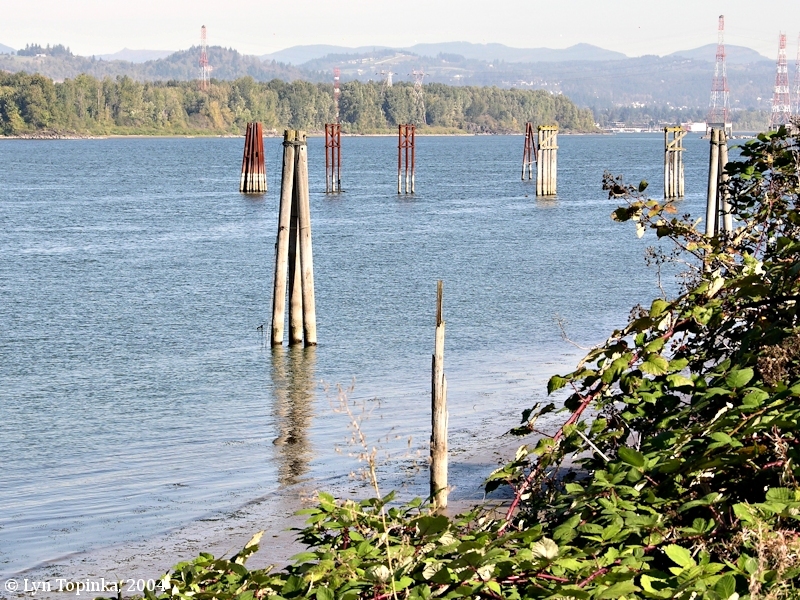 Portland Flotilla to Go Up Columbia for Labor Day Outing. "Final arrangements for the Labor Day cruise of the Portland Motorboat Club will be completed at a meeting of the club members Tuesday evening. Lady Island, 12 miles above Vancouver, Wash., on the Columbia River, will be the destination of the local motorboat enthusiasts September 4, 5, and 6. The boats will leave the club moorings Saturday afternoon and Sunday morning with the entire flotilla, returning to Portland Monday night. Lady Island is considered one of the best camping grounds near Porland." Source: "Morning Oregonian", August 28, 1915, courtesy University of Oregon Historical Newspaper archives, 2015. 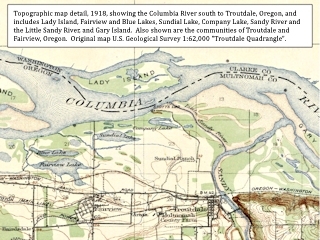 Click image to enlarge Fairview Lake (foreground) and Blue Lake (behind), with McGuire, Government, and Ackerman Islands (middle left) and Lady Island (middle right) on the Columbia. View from airliner heading towards PDX. Mid afternoon, clouds, gray, and drizzle. Image taken April 24, 2012.